We’d love your help. 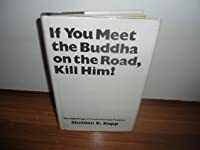 Let us know what’s wrong with this preview of If You Meet the Buddha on the Road, Kill Him by Sheldon B. Kopp. To ask other readers questions about If You Meet the Buddha on the Road, Kill Him, please sign up. Recommends it for: Who wants to know that one is always alone. When I started the book, I felt this guy has something new to say, or may be something new about Zen, as the title was confluence of zen and psychotherapy. But it turned out it was not about zen. The book captures the essence of therapist-client as a parallel journey of two human beings in a relationship dependent upon the ability of both to become careful (full of care) for the other while traveling through metaphors, symbols, sagas and myths, each telling their stories along the way. This book When I started the book, I felt this guy has something new to say, or may be something new about Zen, as the title was confluence of zen and psychotherapy. But it turned out it was not about zen. The book captures the essence of therapist-client as a parallel journey of two human beings in a relationship dependent upon the ability of both to become careful (full of care) for the other while traveling through metaphors, symbols, sagas and myths, each telling their stories along the way. This book reminds us that we are all humans, that nobody has all the answers. Even a teacher or a guru or a psychotherapist is a struggling human being, just like you and me. Well it sounds depressing but in it is also implied that one is no more wiser or no less fool than anyone else. Life is a series of struggles that one has to face alone, all by himself. 4. We are all already dying and we'll be dead for a long time. حرف اصلی کتاب اینه که: معنایی بیرون از ما وجود نداره. به خاطر همین هم اساتید ذن به شاگردهاشون می گفتن: اگه بودا رو در راه دیدید، نه فقط بهش گوش نکنید، بلکه بی درنگ بکشیدش! شاگرد خودش باید متناسب با خودش راه خودش رو پیدا کنه. این حرف به طور کامل در فصل اول کتاب توضیح داده شده. فصل های بعدی نویسنده فقط به راه های مختلف به تکرار همین حرف می پردازه و دیگه چیز جدید زیادی برای عرضه نداره. در نتیجه کتاب کم کم حوصله سر بر میشه. ر چند کار جالبی که می کنه، اینه که در فصل دوم، این حرف رو در داستان های مختل حرف اصلی کتاب اینه که: معنایی بیرون از ما وجود نداره. به خاطر همین هم اساتید ذن به شاگردهاشون می گفتن: اگه بودا رو در راه دیدید، نه فقط بهش گوش نکنید، بلکه بی درنگ بکشیدش! شاگرد خودش باید متناسب با خودش راه خودش رو پیدا کنه. این حرف به طور کامل در فصل اول کتاب توضیح داده شده. فصل های بعدی نویسنده فقط به راه های مختلف به تکرار همین حرف می پردازه و دیگه چیز جدید زیادی برای عرضه نداره. در نتیجه کتاب کم کم حوصله سر بر میشه. ر چند کار جالبی که می کنه، اینه که در فصل دوم، این حرف رو در داستان های مختلف (از گیلگمش و داستان آدم و حوا، تا مکبث و دون کیشوت) پیگیری می کنه، و با داستان هایی که از بیمارهاش نقل می کنه تطبیق می ده. توی ریویوهای انگلیسی نوشته بودن که دو فصل پایانی حتی از این هم تکراری تر می شن، اینه که از خیر دو فصل پایانی گذشتم. ما همه "مگس های یک روزه" هستیم. همان حشرات نحیف با بال های نازک و دم های بلند، که یک سال طول می کشد تا متولد شوند و فقط چند ساعت زندگی می کنند تا بتوانند جفت گیری کنند. این مگس ها نه دهان دارند و نه معده، زیرا آن قدر زنده نمی مانند که نیاز به خوردن پیدا کنند. تخم هایی که می گذارند یک سال پس از مرگشان، شکسته می شوند و نوزادان جدیدی متولد می شوند تا همین روند را ادامه دهند. این ها همه برای چیست؟ هدف این همه چیست؟ هیچ هدفی به کار نیست. دنیا همین گونه است که هست. این نه خوب است و نه بد. زندگی صرفاً "اجتناب ناپذیر" است. بیمار اصرار دارد که باید معنایی به کار باشد که او هنوز به آن نرسیده، و اگر به آن برسد سعادتمند خواهد شد. او می پرسد "چرا؟ چرا این اتفاقات برای من افتاد؟" او فکر می کند که اگر بتواند بفهمد، اگر مشاور بتواند برای او توضیح دهد، آن وقت او خواهد توانست همین زندگی را به همین شکل ادامه دهد و سعادتمند باشد. اما چنان که کسی می گفت: "معنای زندگی تنها می تواند بر خود شخص آشکار شود، و توضیح دادنی نیست". تنها هدف زندگی این است که هدفی ندارد. An old professor stood in front of our class and pointed to this book, saying, "This is what separates the therapists from the advice givers." It's also the book that lead me to define better my role as a therapist...and making VERY clear the separation with friends who know me as a "thoughful friend who happens to also be a therapist." I picked this book up based on a recommendation from a friend. The book gives examples of different types of pilgrimage, and looks at the motives behind each, comparing them to the journey psychotherapy patients goes in their quest for peace of mind. The basic message behind the book is that you don't need a guru/teacher/psychotherapist to attain peace, since you already possess the knowledge you need and must look for meaning within rather than solutions from others. "If you meet the Buddha on the I picked this book up based on a recommendation from a friend. "If you meet the Buddha on the road, kill him" is an expression that means you don't need to rely on a teacher for enlightenment. I found the book to be too simplistic, and it downplayed the role psychotherapists can play in helping their patients make sense of their pains. I was one of the several who picked this up after it was mentioned on the television show "Fringe" as being the favorite book of one of the main characters. I have no background in psychology and have never been in therapy, but can say it was well worth the 2 month wait for a battered paperback to come in through interlibrary loan. Full of fantastic quotes, interspersed with narrative (which occasionally meanders a bit -- though staying true to the nature of the book), I'll agree with another rev I was one of the several who picked this up after it was mentioned on the television show "Fringe" as being the favorite book of one of the main characters. I have no background in psychology and have never been in therapy, but can say it was well worth the 2 month wait for a battered paperback to come in through interlibrary loan. If I Meet Sheldon B. Kopp on the Road, I will Kill Him! That's what I thought when I was halfway through the If You Meet the Buddha on the Road Kill Him. Towards the end though it completely changed my perspective. Don't be biased like I was after seeing the "The Pilgrimage of Psychotherapy Patients" in the title and the continuous mention of "in therapy" throughout the book. "The most important things that each man must learn no one can teach him. Once he accepts this disappointment, he will be If I Meet Sheldon B. Kopp on the Road, I will Kill Him! That's what I thought when I was halfway through the If You Meet the Buddha on the Road Kill Him. Towards the end though it completely changed my perspective. Don't be biased like I was after seeing the "The Pilgrimage of Psychotherapy Patients" in the title and the continuous mention of "in therapy" throughout the book. "The most important things that each man must learn no one can teach him. Once he accepts this disappointment, he will be able to stop depending on the therapist, the guru who turns out to be just another struggling human being." This is what is written at the back of the book and is emphasized throughout as well. But the message doesn't ends here and you end up knowing or rather remembering, like a forgotten dream, much more than you thought. The book is divided into four parts which I will not mention. The journey was rewarding and I just loved Part III and Part IV. Writings and tales have been included to give a fresh perspective to the book but there lies its folly as it has become rather a confused mixture and that's why Part II tends to be the weakest. But the author draws from his personal experiences as well and this is what makes this book so realistically honest. Wow, I first read this 28 years ago! WOW. I had been in therapy for 6 yrs at that point, and my first emotion was embarassment. When he described the initial stages of the a new patient starting in therapy, I thought, "Oh, god, you mean EVERYONE does that?!?! ARRGGHH!!" Even as I was laughing. To this day, I remember and quote lines from the Eschatological Laundry list. For someone in the working world (and ain't we all), one of the most critical and useful (however shocking I found it initially) Wow, I first read this 28 years ago! WOW. I had been in therapy for 6 yrs at that point, and my first emotion was embarassment. When he described the initial stages of the a new patient starting in therapy, I thought, "Oh, god, you mean EVERYONE does that?!?! ARRGGHH!!" Even as I was laughing. To this day, I remember and quote lines from the Eschatological Laundry list. For someone in the working world (and ain't we all), one of the most critical and useful (however shocking I found it initially) is "All decisions must be made on the basis of insufficient data." So many times, I remember that. Avrei voluto dare 4,5 stelline. Una sola cosa è importante nella vita: ascolta gli altri, ma non vivere la vita di nessun altro. Detta così può sembrare un cliché da canzoncina di una ragazzina quindicenne, ma non cambia il fatto che sia la realtà. È uno dei libri che regalerei a tutti quelli che conosco. Doug, wise friend from The Village Bookstore and Writers Group, recommended this book to me. It's interesting and thought-provoking. Kopp compares psychotherapy to a spiritual journey, and by the end of the book, I knew it was just that. He takes seveal classic books and shows us the pilgrim's path and compares them to different aspects of therapy and the therapeutic relationship. I love the author's honesty and openness, sharing his own life and struggles. When I saw the title, I thought, why w Doug, wise friend from The Village Bookstore and Writers Group, recommended this book to me. It's interesting and thought-provoking. Kopp compares psychotherapy to a spiritual journey, and by the end of the book, I knew it was just that. He takes seveal classic books and shows us the pilgrim's path and compares them to different aspects of therapy and the therapeutic relationship. I love the author's honesty and openness, sharing his own life and struggles. 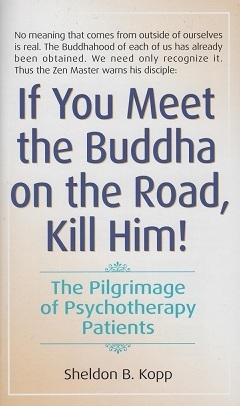 When I saw the title, I thought, why would anyone want to kill Buddha? But the main premise of the book is that one does not need a guru or a master of any kind. A therapist or teacher can be a fellow traveler, one more experienced, that can help us. But an adult can't be another adult's diciple. I am one of the people to read this book because of it being mentioned in the TV series "The Fringe". It was recommended reading to understand the relationship between Peter and Walter. I have never read a book on Psychology (the voices in my head had up until now convinced me I didn't need to) and I didn't expect to enjoy this or understand what was going on. I actually did enjoy this, I think I even understand the reason it was mentioned in the TV series, the journey is not just for the patien I am one of the people to read this book because of it being mentioned in the TV series "The Fringe". It was recommended reading to understand the relationship between Peter and Walter. I have never read a book on Psychology (the voices in my head had up until now convinced me I didn't need to) and I didn't expect to enjoy this or understand what was going on. I actually did enjoy this, I think I even understand the reason it was mentioned in the TV series, the journey is not just for the patient it is for the psychologist too. If Sheldon B. Kopp had been born 10 years later he would have fit right in with the beat generation, his general outlook on life fits right in with them. He comes across in this book as very honest, He talks about a breakdown he had after an operation, he writes about his early patients and the journey had to being able to help them better. This book is about taking a journey/pilgrimage, doing something life changing, i would recommend this to anybody who has been on one or is planning too, it may give you a bit of insight. My favourite part of the book is the section where he is talking about literature which features some kind of journey, from the canterbury tales to Dante's inferno it gives you a look at a side of these stories you might never have considered before. My only wish (and this is why it only gets 4*) is that he never covered anything by Jack kerouac, the writer who has been on so many journeys, it would have been interesting to see what he thought of that. I really enjoyed this book and glad I gave it a chance. Forse non è proprio da 5 stelle, ma chissenefrega! Leggendolo vieni messo davanti ad uno specchio e quello che vedi non ti piace per nulla. L'autore paragona l'essere umano ad un pellegrino che prosegue lungo la sua strada in una continua scoperta di sé che è destinata a durare fino alla fine dei suoi giorni. Sebbene sia scritto da uno psicoterapeuta e spesso vengono fatti riferimenti ad esperienze da lui avute nel corso della carriera, ciò che mi ha colpito fin dalle prime pagine sono i continui Forse non è proprio da 5 stelle, ma chissenefrega! Leggendolo vieni messo davanti ad uno specchio e quello che vedi non ti piace per nulla. L'autore paragona l'essere umano ad un pellegrino che prosegue lungo la sua strada in una continua scoperta di sé che è destinata a durare fino alla fine dei suoi giorni. Sebbene sia scritto da uno psicoterapeuta e spesso vengono fatti riferimenti ad esperienze da lui avute nel corso della carriera, ciò che mi ha colpito fin dalle prime pagine sono i continui rimandi a grandi classici della letteratura. Viene tracciata una linea che collega libri come l'epopea di Gilgamesh, il Tao Te Ching e Don Chisciotte con i più recenti trattati sulla psicologia per delineare i tratti fondamentali della natura umana, tratti spesso sconvenienti, ma che vanno accettati per poter vivere in pace con sé stessi (o almeno provarci). I rarely say it, but I think this is an absolute must-read. Some views are outdates, ok, but if you go beyond those few limits, this is the best thing you can read on the meaning (or rather on the lack of meaning) of life, and on the journey of the pilgrimage/human being trough it. The style is spontaneous and authentic, and the ideas expressed contain great wisdom. Do yourself a favor and read it. This book is a good therapy session for the atheist/agnostic who loves to deal with the ‘big questions’ inside their head, or is too poor to see a psychologist. I would not rule out that a religious person could get a lot of this book, as I’m sure they could. However, I think those with literal interpretations of holy books would have a hard time with what Dr. Kopp recognizes as the first step in any patient’s pilgrimage: there is no point to anything, and this world is all that we have. If You S This book is a good therapy session for the atheist/agnostic who loves to deal with the ‘big questions’ inside their head, or is too poor to see a psychologist. If You See the Buddha On The Road, Kill Him! (hereafter referred to as ‘this book’) is a multi-layered book about Dr. Sheldon B. Kopp’s experience in psychotherapy, specifically what he sees as the pilgrimage of every patient that comes to him. Interestingly enough, his goal with his patients is to get them to the point that they realize they don’t need a guru. Each person is his own judge of what is best, so any meaning that comes from outside of himself should not be trusted (hence the attention-grabbing title of the book). In the first part of the book, Kopp lays the foundation of his goals for his patients. As already mentioned, this includes showing them that they are their own guru. But Kopp says that another important part of this is for the psychotherapist to not act like a guru. Many patients become frustrated by this, wanting instead a quick, professional answer to their problems. Kopp also maintains that the psychotherapist should be a fellow pilgrim by growing along with the patient, and sharing one’s experience when prompted by the patient. The second part of the book describes the individual components of a pilgrimage and explains each by relating the concept to classic literature such as Siddhartha, Don Quixote, Canterbury Tales, Allen Ginsburg, and others. This was a great approach for me, fiction lover that I am. However, I also thought it was a great way to explain difficult concepts by way of metaphor. In these sections Kopp tackles subjects like the quest for love, the quest for power, and the quest for meaning. One of my favorite lessons from these sections was that though Kopp recognizes life as ultimately meaningless, he still prefers someone like the character of Don Quixote who imbues his life with meaning. If I had any criticism of these sections, it would be that his recaps of the classic literature sometimes go on too long. However, his analysis of these stories were still fascinating to read, and in the end I really didn’t mind them. The last part of the book shares some specific experiences from Kopp’s psychotherapy career, and also a few personal reflections. His experience with counseling prisoners was particularly striking, as it shows how sometimes the more abrasive a man is on the outside, the more troubled he is on the inside. It reveals how hard it is for men to admit something can get to them, and it’s amazing to see the effect s childhood can have later in life. Of his personal life, Kopp’s bout with brain surgery (and his ensuing depression and hostility) makes the teachings of the book ring with authenticity. Also interesting was Kopp’s analysis of how each generation of young adults (he was a ‘hipster’ in the 40’s) leaves traces of their legacy, and in a sense teaches us all something. I often found instances of myself in between the pages of the book. The most memorable instance was when Kopp relates an experience with a patient who had himself so figured out and self-analyzed that he left no room for any other possibility. The reason I read this book was that someone handed me copied pages of the last part of this book, Kopp’s famous Eschatological Laundry List because my story “Missionary” reminded them of this book. If you don’t read the book, at least check out the Eschatological Laundry List below and you’ll get the gist of what this books is about. I haven't read it yet, but I'm planning to because a character in the tv show Fringe said it was his favorite book. So I have to know what it's about. Psychotherapist Kopp wrote this book in 1972, but it still works today. This book is a wonderful read for anyone who wonders, worries or agonizes about the meaning of life, and whether they're doing it "right." Whether giving or receiving therapy, this book reminds us that we are all humans -- nobody has all the answers. The eschatological laundry list (which I've seen roaming around the web, but never attributed to Kopp) has become a classic. 3. You Psychotherapist Kopp wrote this book in 1972, but it still works today. This book is a wonderful read for anyone who wonders, worries or agonizes about the meaning of life, and whether they're doing it "right." 14. You can't make someone love you. I'll stop there -- there's more in the book, and if you find the list discouraging, you need to read the book. If you find the words encouraging, you need to read the book. Add it to your list of books to give friends who are feeling glum and hopeless. Use it as a group discussion book! I went into reading this book with an expectation that I knew what to expect. What I got out of the book was far more than I believed. Along with the realization that I had no idea what I was thinking, I found parts pissed me off, parts made me happy, parts made me introspective, and other parts made me cry. At no point did I feel I was wasting my time reading the book. While some of the material is definitely dated, and my copy had been updated to include both genders (at certain points), I fel I went into reading this book with an expectation that I knew what to expect. What I got out of the book was far more than I believed. Along with the realization that I had no idea what I was thinking, I found parts pissed me off, parts made me happy, parts made me introspective, and other parts made me cry. At no point did I feel I was wasting my time reading the book. While some of the material is definitely dated, and my copy had been updated to include both genders (at certain points), I felt that the lessons I learned and what I'm taking away from the book far outweigh the few slights. Fantastic book for anybody in therapy. Anybody that tells you they have all the answers is a wolf in sheep's clothing. The whole book is worth the axioms at the end. Enjoy! This actually surprised me how much I liked it. It reads very easily despite being solely addressed to men. I liked the tone of the book as well as the eternal truths and tales of pilgrimage and how that all related to life and therapy. All in all this was a decent, thought-provoking read. However it did leave me feeling the strong and rather conflicting presence of the author. At times he comes off as an arrogant know it all, who claims insights that are a least a bit contrived. He also clearly loves talking about himself, even when he is telling a story about someone else. He does, more toward the end of the book, show more vulnerability and honesty, perhaps enough to look past the otherwise somewhat negative vibe he creates. All in all this was a decent, thought-provoking read. However it did leave me feeling the strong and rather conflicting presence of the author. At times he comes off as an arrogant know it all, who claims insights that are a least a bit contrived. He also clearly loves talking about himself, even when he is telling a story about someone else. He does, more toward the end of the book, show more vulnerability and honesty, perhaps enough to look past the otherwise somewhat negative vibe he creates. His main complaint against therapy is that most people go into the situation expecting their therapist to fix them, and/or their problems. There is far more to be gained once one finally understands the fact that if there is work to be done, they have to do it themselves. One must be prepared to take a hard honest look at their own part in creating their life situations. The text often dates itself (the authors casual references to the merits of a good beating to correct a disruptive child for instance) and at times the author comes across as downright narcissistic. Still, Kopp does encourage a path of personal responsibility, and ownership of your part in creating your life as it is. If you can get past the author himself, there is a lot to be gained from the ideas he presents. Worth a read. Really enjoying the message, except for the author's struggle with the plight of the female. Ironically I think the stories that he adds in order to give examples or clarification are distracting from the meat of the book, I think they're just too archaic for me. It's funny that I've had this sitting on my shelf for over three years, and I just now picked it up to read it and found so many parallels with what I'm thinking and going through presently. At times, synchronicity i Really enjoying the message, except for the author's struggle with the plight of the female. Ironically I think the stories that he adds in order to give examples or clarification are distracting from the meat of the book, I think they're just too archaic for me. I read this while a teenager at the request of my Father. I don't know why, since I wasn't into any "subversive" groups (at the worst, it was the Girl Scouts), but the content has really helped me as I grew up and developed an interest into alternative religion. The lack of "googly-eyes" in this field, where almost everyone who publishes a book gains an ego and expects fawning followers - they just don't impress me. I do make mistakes now and then, but I can't help but weed out "fluffy-bunny" ne I read this while a teenager at the request of my Father. I don't know why, since I wasn't into any "subversive" groups (at the worst, it was the Girl Scouts), but the content has really helped me as I grew up and developed an interest into alternative religion. The lack of "googly-eyes" in this field, where almost everyone who publishes a book gains an ego and expects fawning followers - they just don't impress me. My professor for Intro to Counseling recommended this, The Velveteen Rabbit, and Stella Luna as his favorite books. Basically, the key to psychotherapy is that there is no key. Anyone claiming to be "the Buddha" is dangerous because one of the central points of Buddhism is that we're all buddhas, we're all seeking enlightenment. As a therapist, you can't cure anyone you can only help people cure themselves. I had to re-read this book, because the first time I was not paying as much attention as I should have when I was reading it. I'm so glad that I did! From this book you can learn so many things about life and how to deal with your own problems. It has helped me to overcome some of my own problems. I recommend it to anyone who feels like his/her life has lost any meaning and to people who are interested in psychology. The first part was slow going, it took me a while to get into the rhythm of the book. I really liked part two where he uses epic tales to convey his message. Part three and four using his clinical and personal life experiences put it all together for me. Now I understand the title of the book and also need to try and remember "... our very efforts to catch hold of what we are seeking may prevent us from discovering what is already there." There are a lot of good ideas in this book, and much of it is compelling reading. Take what you can and discard the rest. This book reminds me a lot of "Zen and the Art of Motorcycle Maintenance" - totally mind-expanding in an intellectually fluffy sort of way.